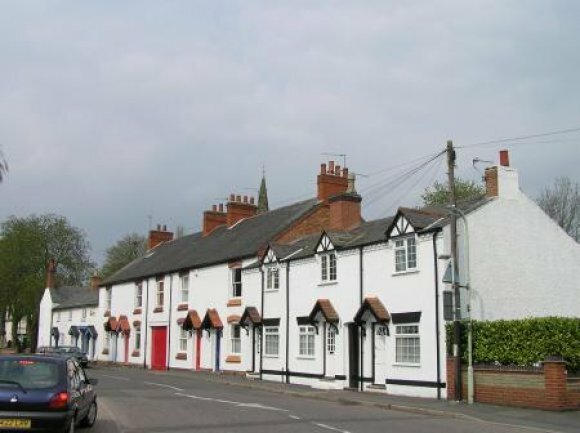 Desford is a village of approximately 4000 inhabitants, situated about 6.5 miles (11km) west of Leicester and 6.5 miles (11km) north-east of Hinckley in Leicestershire. The earliest written record of Deresford or Diresford is in the Domesday Book of 1086, but the name is older and means Deor's Ford, rather than Deer's Ford, suggesting an Anglo Saxon origin. The earliest signs of occupation are the remains of two Romano-British kilns found on the demolition site of The Manor House in Main Street in 1959, but the oldest surviving building is the Parish Church of St. Martin, largely 13th Century in origin, although the font is Norman. The oldest domestic buildings in the village are probably the Stitch-in-Time house and the Food Room. The Malt House, the Old White Cottage, Old Manor Farm, Ivy House and part of The Old Forge date from Tudor and Stuart times. A fine example of an 18th century Georgian house is The Grange in Church Lane and Manor Farm in High Street dates from the same period. The old part of the village consisting of High Street, Church Lane, Main Street, Chapel Lane, Cottage Lane and part of Newbold Road was designated a Conservation Area by Hinckley & Bosworth Borough Council in 1981. In the medieval period the Manor of Desford belonged to the Earls of Leicester, who in the 14th century became also Dukes of Lancaster and in 1399 were united with the Crown. The present Queen, as a result, is the Patron of St. Martin's Church. The other great influence on the village during these times was the proximity of Leicester Forest, a Royal Hunting Forest, on the south, in which villagers had important rights of common until it was disafforested in 1628. The great majority of villagers were engaged in agriculture until at least 1700, farming arable strips in four Open Fields of the parish, and pasturing their animals on the low lying meadows by the streams. In 1760, however, by private Act of Parliament, the 1000 acres of the Open Fields were enclosed, and the new fields hedged and farmed separately; an enormous change. Prior to the Industrial Revolution the cottage industry of stocking or framework knitting developed in the village, the first reference being in 1704. This continued well in to the 19th century, with over a hundred framework knitters being recorded in the 1851 Census. The 19th century was a time when coal mining became a large scale industry in west Leicestershire. In 1875 an unsuccessful attempt was made to sink a coalmine in the parish, at Lindridge. This failed due to constant flooding. In the present century the nearest coal mine, Desford Pit, only two miles away, employed many Desford people until it closed in 1984. In 1866 a Chapel was built at the top of Chapel Lane. Subsequently enlarged, it is now the Desford Free Church. The railway came to Desford in 1832, part of the original Leicester to Swannington Railway, built by Robert Stevenson and the third oldest line in the world. Originally constructed to bring coal to Leicester, it was also a passenger line until 1964 and Desford had its own station. The larger houses in Station Road were built for middle-class commuters to Leicester. Since the Second World War the village has changed and grown, with both council houses and private estates being built. Local industry has provided employment both at Timken at Newtown Unthank (now Crowncrest), and at Caterpillar on a site between Desford and Peckleton, which was formerly a private aerodrome and then an RAF Training Centre during the War. Today, with increasing car ownership, Desford has become a largely commuter village, and the number of shops and pubs as well as farms has decreased. The rise in population, however, brought a new secondary school, Bosworth Community College (now Bosworth Academy), to the village in 1969, and the old village schools in Main Street were replaced by a new County Primary School in Kirkby Road a few years earlier. Botcheston and Newtown Unthank with a combined population of about 500 are also in the parish of Desford. The retirement village of Kirby Grange occupies the site of Polebrook House, a former Industrial School. Known once as Bocharston or Bocheston, the hamlet of Botcheston did not exist at the time of the Domesday survey. It was once in the parish of Ratby but from around 1936, Botcheston has been part of the parish of Desford. Seven miles north of Leicester, the hamlet contained 500 acres and had just 37 people in 1846. Botcheston is a rural community. There is no church in Botcheston and the school was closed in 1931 but there is a public house. The Greyhound has only existed since the mid 19th century. Botcheston was also home to Desford Boys School, an Industrial School for difficult boys, but that closed in 1978. The presence of the school inflated the population figures because it housed about 200 boys.